3 Winners / 3 Drawings - Win a custom L.O.S.T. latte mug or a print copy of Enemy Lover. 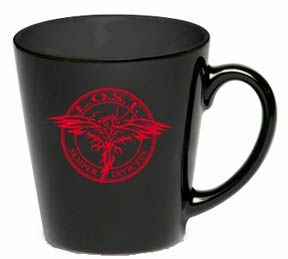 Two copies of Enemy Lover will be drawn for as well as one mug. To Enter: Just comment on this blog post. Before I start, I’d like to say, I’m really excited to be here at Night Owl Romance! Thank you for having me! Ok, so I’m often asked, “Why do you write?” And depending on the day, my mood and how the writing is going, it could be one of several answers. When I wrote my first story, at the tender age of 17, it was a fantasy. A fantasy in that it was a copulation of my daydreams. I was a happy, normal girl growing up. I had the same great boyfriend throughout high school, but my daydreams took me to far off places where I was braver, smarter, prettier and I made things happen. My character made a difference. Of course, this always caught the notice of the hottest guy around. Once he saw me, he was love-struck by a lightening bolt through the heart. It was love at first sight for us both. And together, we rode off into the sunset and conquered the world. So, one reason I write, is because I have stories to tell. They are not about me anymore, but there is always a part of me in my heroines. I married my knight in shining armor, a cop who is now retired and there is a little of him in every hero I wrote. Together we do some pretty amazing things. I write because it gives me the freedom to be home, with my family, where I pretty much pick my hours. I don’t have to put makeup on or wear snazzy suits. Hell, I don’t have to bush my teeth if I don’t feel like it! And before anyone is thinking, Harlow is gross, let me say for the record, despite wearing jogging pants and tees as my new power suit, my hygiene has always remained a priority. I also write because it affords me an income. I am, a working writer. Yes, some days I do not want to go to work, and I play hooky. Some days I sit frustrated at my keyboard and wonder where my imagination has gone. Some days, I just want to go back to bed. But most days, I smile in anticipation. Meeting up with my characters where we left off is always a challenge I’m up for. My heroines are smart, brave, and pretty, but not always pretty in the classic sense. My heroines do things I would never do. L.O.S.T. (Last Option Special Team) operative Jax Cassidy in ENEMY LOVER is brazen, bold, highly intelligent, a femme fatal to a T, and the first person I would call if I needed help. As I wrote ENEMY LOVER, I lived vicariously through her. And as exciting as it was, I liked to keep it that way. My heroes, ahh, they are alpha, and smart, and brave and devastatingly handsome, scars and all. They are tortured souls who have turned their backs on humanity. Some, like Marcus Cross, Jax’s hard-earned hero in ENEMY LOVER is not only a vampire, but a vampire who owns the term. He makes no excuses for what he is: a predator. With his heightened senses and powers, Marcus is at the top of his game, and as an assassin, they don’t come more lethal then Marcus Cross. Now, the real reason I write, no let me rephrase: The real reason I LOVE to write is that it affords me the opportunity to meet the most intriguing people in the world. Writing takes me places I would have never ventured to go. Writing gets my adrenaline pumping, and my heart racing. Writing makes me feel the full spectrum of emotions. It shakes me up and invigorates me. And more than anything, writing gives me a Happily Ever After each time I type The End. I love that part of my job. How about you? What do you do for a living and what do you love most about it?